Our workshops have taken a variety of forms in fostering collaborations between our lab and people outside of academia. Topics have ranged from sharing of technical/mapping expertise to exploring local knowledge and resilience. During a month-long visit to India in August 2013, we delivered an interactive workshop with managers (social scientists and ecologists) from all across India. With the Wildlife Institute of India, we explored social-ecological systems and feedbacks at a variety of parks and reserves across India under-going sustainable development interventions as part of a World Bank project. We are excitedly developing similar social-ecological content, along with Geomatics content, for a new collaboration with the University of Central Asia in the Kyrgyz Republic. Among our first initiatives was the two-phase workshop: High Spatial Resolution Remote Sensing and Introduction to Accuracy Assessment. 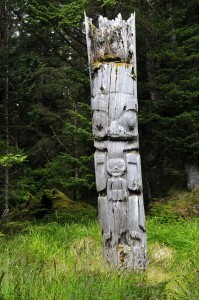 The first workshop happened at UBC in Fall 2006 with a visit by Haida Heritage – Forest Guardians & Mapping Specialists. This was followed by the larger Workshop II in Summer 2007 for local managers in Haida Gwaii, BC. In addition to her research, Dr. Hilary Thorpe (NSERC PDF) has coordinated two recent educational initiatives on Haida Gwaii. First, members of the Landscape Ecology Lab (Gergel) and the Tree-Ring Lab (Daniels, Geography) hosted a week-long Aerial Photo and Dendrochronology Workshop on Haida Gwaii in Summer 2009. This well-attended workshop for local managers provided training in cutting edge digital air photo techniques and dendrochronological tools. The workshop promoted collaborative opportunities among representatives from Haida Mapping, Ministry of Forests & Range, Parks Canada and many other islanders interested in historical ecology and management. 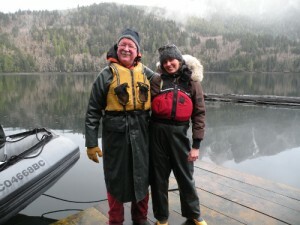 Dr. Thorpe also coordinated the first “Haida Gwaii Semester in Natural Resource Studies,” an interdisciplinary undergraduate program offered through UBC Forestry by the Haida Gwaii Higher Education Society. The program ran from January to April 2010 and included courses taught by Dr. Thorpe as well as Andy MacKinnon (graduate student), who taught Rainforest Ecology and Management. In coordination with the Stockholm Resilience Centre, we are hosted a workshop on Spatial Analysis Tools for Incorporating Local Perspectives into Landscape Management in Fall 2010. Support from UBC’s Teaching and Learning Enhancement Fund helped us develop teaching tools for undergraduates in our Natural Resource Conservation Program. We developed a series of global case studies which incorporate and support local and indigenous perspectives on resilience and ecosystem services into our curricula. We also developed several network analysis exercises which will be incorporated into the 2nd edition of Learning Landscape Ecology.